This is the first installment of my Canary in the Coal Mine series. These will be regular posts that will highlight specific projects, studies, or species that are indicators of climate change. It seems only fitting to begin this series near the bottom of the food chain. That is, after all, the foundation upon which the survival of all other species rests – including our own. Antarctic krill (Euphausia superba) are a key component in an enormous food web that includes fishes, several species of penguins, seals, and baleen whales – all of which hunt the Southern oceans surrounding Antarctica. Since the 1970’s krill populations have plummeted 80% and a number of studies point to a link between a warming climate and reduced krill abundance. For an unassuming creature that weighs only a gram, it is surprising to learn that these 4-5 cm shrimp-like crustaceans are measured in units of millions of tons. Krill live in tightly-packed swarms (upwards of 30,000 individuals per square meter) that rise and fall the ocean’s water columns. A single swarm can contain up to 2 million tons of krill and can span 450 square kilometers. In fact, Antarctic krill make up an estimated biomass of over 500 million tons making them one of the largest protein sources on the planet. Not only are krill the main food source of for whales, penguins and seals, but human harvesting of krill from Antarctic waters adds up to about around 100,000 tonnes per year. Most of this is used as food in aquaculture and for human consumption (primarily in Asia). Krill feed on phytoplankton. Like plants, phytoplankton obtain energy directly from the sun via photosynthesis. Krill are the intermediary step required to convert that energy into a usable form for larger species. The remarkable fact here is the brevity of the food chain: near-microscopic phytoplankton feeds krill; krill, in turn, feed 200-ton whales. This represents one of the most efficient conversions of sunlight to protein on earth. Besides forming the basis for this remarkable food chain, krill are also instrumental in returning carbon to the seabed. 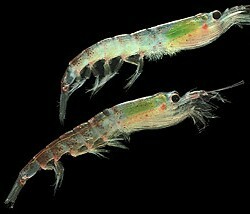 After feasting on carbon-dioxide soaked algae and phytoplankton, the krill get full and sink. 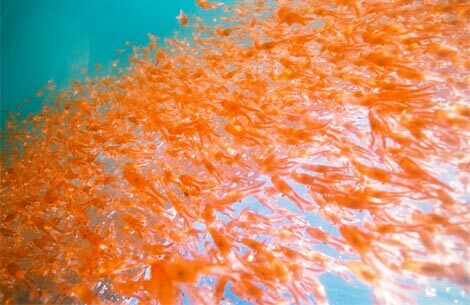 Since a krill swarm may typically be as deep as 30 meters, krill descend and rise within the swarm creating a large ever-churning mass of animals. As individuals drop to the bottom of the swarm, their digestion completes and they defecate, leaving the carbon to sink to the ocean floor. They then ascend and resume feeding. It is thought that they complete this cycle two or three times a night in the summer and, in the process, sequester 2.3×1013 grams carbon each year in the southern ocean alone. According to one writer, this is equivalent to the annual emissions of 35 million automobiles (readers, feel free to correct this if necessary). Krill reproduction is wholly dependent on Antarctic sea ice conditions. Seasonal studies have shown that winters with reduced size and duration of winter sea ice coincide with poor krill reproduction. This is because the underside of sea ice is coated with ice-algae which serves as the main food for krill during the winter when phytoplankton is unavailable. 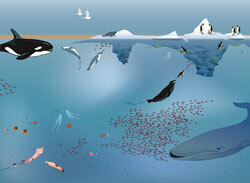 In addition, the protected area under the sea ice serves as a safe “nursery” for krill larvae, protecting them from large predators, such as whales, which can consume several tons of krill in a single feeding. Today the Antarctic Peninsula is the most rapidly warming region in the southern hemisphere. Over the last half-century, it has warmed by 2.8°C causing a startling decrease in winter sea ice – both in size and duration. In this time, 25,000 square kilometers of ice have been lost from ten floating ice shelves. This corresponds predictably with the 80% reduction in krill abundance in the last 30 years. 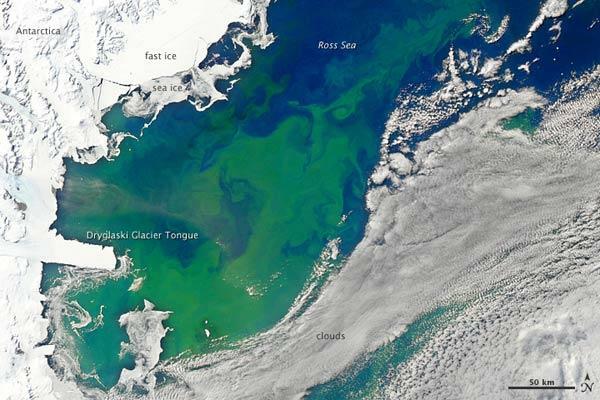 Antarctic warming is also correlated with a reduction in phytoplankton, which requires an annual melt of sea ice in order to “bloom” on the ocean surface. The less ice there is to melt each year, the smaller the phytoplankton bloom and the less “summer” food is available to the voracious krill. Finally, and very importantly, with the reduction of krill comes a rise in competitor species, primarily salps. 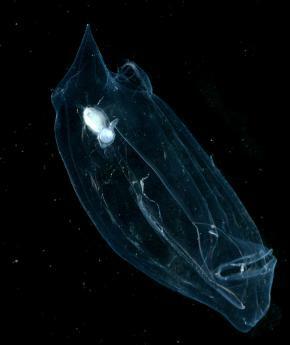 Salps are gelatinous creatures that also inhabit the Antarctic marine environment. Salps eat phytoplankton but require much less than krill. As phytoplankton numbers fall, krill populations fall and salps move in to replace them. Salps, however, are the ocean’s Jell-O — empty calories, almost devoid of nutrients. They cannot replace high-protein krill as sustenance for larger predators. Plankton and krill make up the largest biomass on the planet. The impact of their demise can’t be overstated: the entire ocean ecosystem depends on them – and by extension, so does the land ecosystem. Their precipitous decline, correlated with reduced sea ice and warming temperatures is most certainly a global alarm call. Very interesting post, and a worrying trend indeed. I have this objection however. I am not sure I agree that all land ecosystems are affected by the decline of the krill. Sure there are likely to bee cascading effects in the ocean, and especially in the coastal ecosystems there might connections. But I fail to see how the Serengetti in Afrika, peatlands, alpine ecosystems or lake ecosystems ecosystems would be affected by the loss of krill. All life is connected in the way that they share the same planet, but just as the BP oil spill will affect the Mexican Gulf terribly but not the Victoria Lake, even the complete crash of the ocean ecosystem is not likely to effect the Serengetti. I don´t see the connection, but perhaps I am wrong. Hi Petter, thank you for your comments. The marine plants and animals are important for their role as a biological carbon pumps. Carbon is captured through photosynthesis (by phytoplankton, algae, and marine vegetation) and then transported it to the deep ocean via death of the plants themselves or via defecation and/or death of animals higher up the food chain — from krill to whales. This vertical transfer of carbon, along with the carbon that is stored in the living plants and animals and the dissolved CO2 in the water, make the ocean the world’s largest carbon sink. Without these creatures (and the rest of the marine ecosystem), the CO2 will remain in the atmosphere, leading to climate change that will affect every ecosystem worldwide, including, as you mentioned, the Serengeti, peatlands, alpine and lake regions. Riebesell, U., K. G. Schulz, R. G. J. Bellerby, M. Botros, P. Fritsche, M. Meyerhofer, C. Neill, et al. “Enhanced biological carbon consumption in a high CO2 ocean.” Nature 450, no. 7169 (November 22, 2007): 545-548.